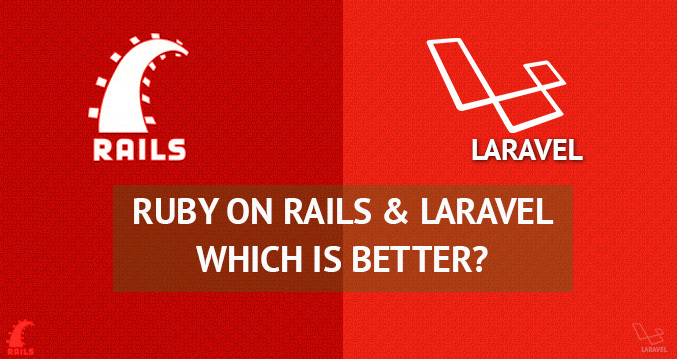 Ruby on Rails vs. Laravel – Which is better? In the spirit of revising the programming basics, I decided to look into this topic today. Over the years, there have been so many arguments on Laravel and Rails. Which is better? Which is more difficult to learn? and so on. – Google: Which framework is better? – Otemuyiwa: Which is more powerful (since both are)? – Mackenzie: Which do you recommend? – Omeiza: What do you look out for in a framework? – Oluwasegun: Are these two the only powerhouse of web frameworks? – Ifeoluwa: Why should I use them? And many other senior men (and women) out there, I doff my hat dab for you o.
building simple and pretty complex apps (which I’m too lazy to publish). I came to realize that neither of the frameworks is bad. Better yet, both frameworks are awesome and unique in their own way. So here’s what I’m going to do: I will list out the similarities and differences (respectively) that I came across with while working with each framework. Hold on a sec… before I proceed, I would like to give a brief intro to both frameworks. If you like to know more get their books! Laravel is a web application framework with expressive, elegant syntax. It is a PHP framework created and released in June 2011, by Mr. Taylor Otwell. Click here to start your own Laravel journey. David Heinemeier Hansson, I love to call him DHH, created Rails from his work on the project management tool – Basecamp, at the web application company also called Basecamp. It’s a Ruby framework, the first release in June 2004, gained popularity around 2005. It caught the attention of Jack Dorsey of Twitter. Click here to enter the world of Rails. They are both OOP-based frameworks. They both follow the MVC software design pattern. They both came from scripting language backgrounds (they don’t need a compiler to interpret their code base). They both offer awesome features in terms of ORM (Object Relational Mapping) and app structure generally. They both have an unbelievably awesome community support. They both emphasize on the Don’t Repeat Yourself (DRY) principle. Deployment: I don’t know about you, but to deploy both frameworks is hectic (at least for the first try). They both have huge varieties of external components, Ruby – gem, while Laravel – composer. The programming languages differ. Rails is from Ruby while Laravel is from PHP. Laravel uses semicolon, but Rails doesn’t. Rails doesn’t use any curly braces, but Laravel does. The way rails declares its functions is totally different from Laravel. Rails is not explicit enough; it assumes too much, but Laravel gives room for creativity. It allows developers to take charge (codebase) – no scaffolding (I know that an experienced developer can bypass that). NB: The aim of this article isn’t to stimulate more arguments but rather to bridge the gap between the two frameworks. One other thing. Hmmmm… They are both cheap, so go out there and start learning. I admit I’m no “know it all”, so leave a reply in the comment section below, with some of the obvious similarities/differences I may have missed out. You really need to learn the two frameworks and the underlying languages before coming up with that comparison. Take a spin around rails + ruby, I’d recommend Rails Tutorial by Michael Hartl then find time to look for a similar easy to use guide on Laravel + PHP. However, the choice for Ruby on Rails is actually the Ruby language itself. Less gibberish than PHP. The major problem with learning Ruby is getting the right study materials together. I have just recently introduced a very good polyglot Developer (he codes very well in C# + .Net + family, Java, PHP+Laravel, AngularJS and Swift+Objective C and a few other languages). Really interesting. I guided him to study RoR. Few weeks later he is back and says not sure he is going back to PHP. That was exactly what happened to me in 2009 before starting on Rails. If you are really fast with developing with PHP and not open to learning, surely Laravel will keep looking interesting. But the moment you switch fully to try Rails, you will find it hard to turn back. All the best on your choices. PS. It might take you 3-4 weeks to get more than a beginner’s grasp of Ruby. Thanks for your comment and constructive criticism. I’m however not saying Laravel + PHP is better than Rails + Ruby. From your comment, I can see that you are a Ruby guy – and a very good one at that. That is not to undermine the power/capability of PHP; a Laravel person might come up today and say PHP is way better. That’s however not the goal. The aim of this article is for developers to embrace and appreciate the merits of each framework and also to share it. Thanks again, Ademola. Your contribution is highly appreciated. “Less gibberish than PHP” what do you mean? PHP has evolved man. i have used Rails and Laravel. i will still go with Laravel any day because i prefer php syntax to ruby’s. PHP evolved but Ruby is definitely one of the best languages. Although RoR and Laravel have similarities (well… MVC right?) with the structure, for the coders side Ruby gives you that relaxing feeling just like you’re conversing with some human and telling him/her “Ruby, get this, define this, this repeat that many times…” etc. etc. while coding in PHP (do not even dare mentioning Java) is like “Ok buddy get this and repeat it that many times” and you get response like “Put a semicolon or I’m not getting that damned thing” or something like “If you’re talking to me, you are using the wrong name (and it’s not telling the name)”. Perhaps you’re better with PHP, everyone has a favourite language, but the fact is that Ruby+Rails are way much better than PHP+Laravel from a developer’s side. Weldone Nnadozie. A researcher creates new knowledge, which is what you have done. Thanks for sharing. Hello NNADOZIE IMO, Both frameworks have surged in popularity because of their accessibility. Ruby On Rails has RailsCasts. Laravel has Laracasts.Rails have been around for longer and more has been written about it. Laravel is growing faster and the community is smaller but more active. There is no shortage of free resources online for learning either framework. I always use Laravel + PHP for build my project. Depends on the project. RoR you can get up and run fairly quick, a huge amount of documentation/guides, and gems to help you along the way. If you want to dabble in pure JS, you can certainly take the route of NodeJS. Laravel and Ruby on Rails are the software development frameworks written in different languages with a similar logic and structure (MVC). What i would recommend is going with whichever language you are currently more experienced with, and I agree with Nnadozi, learning another language and experience the difference would be a wise option. I used PHP many years ago. I learned Rails early before it reached version 1. I started loving Ruby. It’s really a great programming language. I always wan’t to use the best tool. I really hate to use second best tools. I know PHP has evolved since I used it – but it’s still PHP. Ruby is totally different language. It’s a language made from an programming language nerd who wanted to make the best programming language for the programmer – and not like PHP – a ad hock solution for a person who was used to programming with C.
PHP can never be as good language as Ruby, since it’s philosophy is different. I know Rails is awesome and groundbreaking when it was new. I guess Laravel also are greate – but it weakness compared to Rails is that PHP is not as good as Ruby. You have to know the language to really understand why any PHP never can be as nice for the programmer as Ruby.